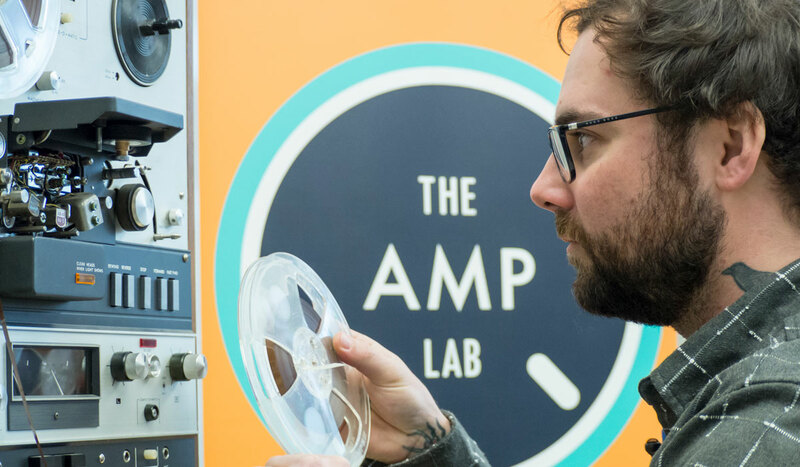 WITH A DISTINCTIVE CLICK AND WHIRL, A REEL-TO-REEL TAPE MACHINE JUMPS TO LIFE in UBC Okanagan’s AMP Lab and a vintage recording of an orchestra fills the classroom. It’s a fitting introduction for alumnus Lee Hannigan, who is back on campus to deliver a talk: “The Unwinding Reel: A Personal Account of Media-Focused Literary Research”, describing his journey from an uncertain undergrad in need of a summer job to a doctoral student with a prestigious fellowship from Canada’s Social Sciences and Humanities Research Council. “No, tell us,” responds Shearer like the straight man in a comedy routine. “It would have been originally black,” Shearer tells the group. “Right!” chimes Hannigan. “And that’s the whole talk!” he says jokingly with a clap of his hands. Learn more about Creative Writing & English The ink-adorned Hannigan is only partly kidding about his talk being over before it starts. A little sheepishly, he explains he has just completed his PhD candidacy exam at the University of Alberta (U of A) and would prefer to conduct the talk as more of a workshop than formal presentation. Hannigan’s personal dive into the world of analog recordings began much earlier, after the fourth year of his undergraduate degree, a double major in Creative Writing and English in UBCO’s Faculty of Creative and Critical Studies. At the time, Shearer was looking to hire a qualified student to digitize a box of reel-to-reels over the summer. Although he had never operated a reel-to-reel sound recorder, Hannigan took a chance and applied, figuring he’d be able to teach himself. 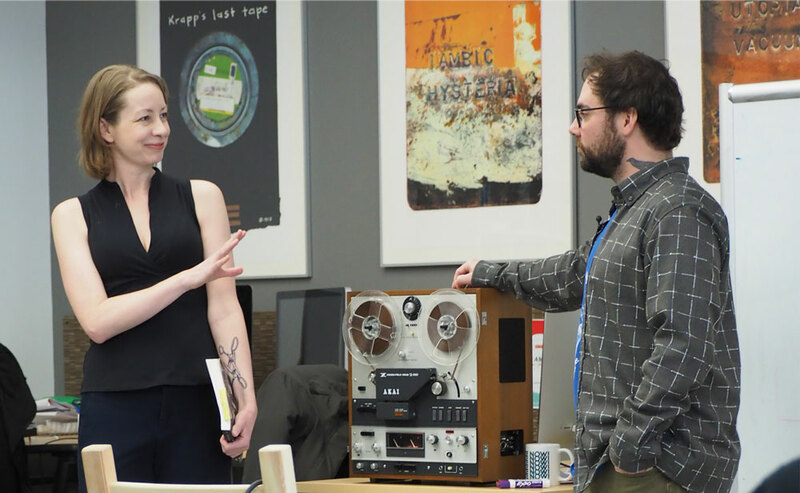 Not only did he learn how to digitize analog tape, he found a passion for researching the literary and social history of magnetic tape sound recordings. From that summer work-study assignment, Hannigan rolled into becoming the first student to work on the UBCO SoundBox collection, which is now part of the SpokenWeb project, an international endeavor to digitize and make troves of literary analog recordings accessible to students, researchers and the general public. “This turned into a huge opportunity because it’s how I met professor Jason Camlot (Concordia University), the principal investigator of the SpokenWeb project,” explains Hannigan, who went on to write his master’s thesis on SpokenWeb under Camlot’s supervision. And the recording didn’t stop there. While Hannigan was completing his master’s degree, a box of analog reel-to-reels of literary audio recordings turned up at the U of A, igniting his PhD studies. Hannigan is now using literary magnetic sound recordings to examine how human social relations were affected by the commercial release of personal sound recorders. It’s clear that Hannigan has a deep gratitude for Shearer and UBCO. There is surprise in his voice when he talks about where his academic career has led. The box of tapes may have been the beginning, but the energy necessary to continue to a PhD was all due to the connections made in that final year of his undergrad, says Hannigan. A self-confessed ‘rabbit-holer’, Hannigan is soon regaling the group at the AMP Lab with theories on the staying power of analog magnetic tape. With a genuine curiosity, he asks the group why they think tape remains prevalent, listing a number of recent Netflix releases that feature analog tape machines, such as Mindhunter and Conversations with a Killer: The Ted Bundy Tapes. It’s clear why Shearer saw promise in Hannigan. He has an uncanny ability to turn the smallest of observations into the deepest of rabbit holes. Hannigan recounts how in the documentary Magic Trip, Ken Kesey — famed author of One Flew Over the Cuckoo’s Nest — turned his psychedelic bus into a mobile recorder with microphones on the outside and the inside. The evolution of the technology, enabling anyone to record their own voice with handheld recording devices, is a phenomenon culture continues to explore, says Hannigan. And it appears, there is no end of rabbit holes to follow.